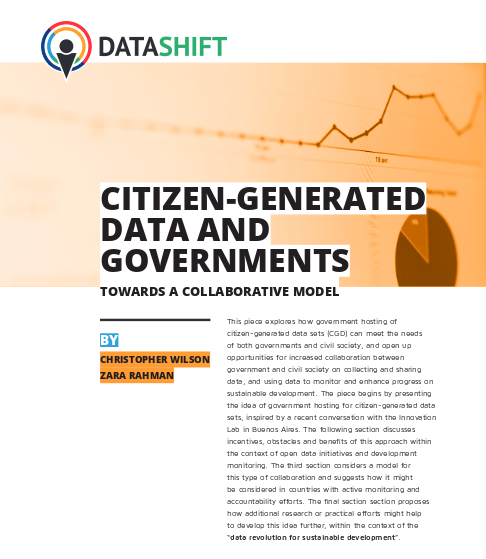 In advance of this week’s Open Government Partnership Summit, we’re very happy today to launch “Citizen-Generated Data and Governments: Towards a Collaborative Model”. 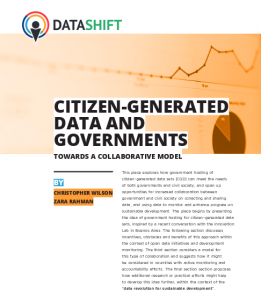 This piece explores the idea that governments could host and publish citizen-generated data (CGD) themselves, and whether this could mean that data is applied more widely and in a more sustainable way. It was inspired by a recent meeting in Buenos Aires with Argentine civil society organizations and government representatives, hosted by the City of Buenos Aires Innovation and Open Government Lab (Laboratorio de innovación y Gobierno Abierto de la Ciudad de Buenos Aires). The meeting was organized to explore how people within government think about citizen-generated data, and discuss what would be needed for them to consider it as a valid method of data generation. One of the most novel and exciting ideas that surfaced was the potential for government open data portals, such as that managed by the Buenos Aires Innovation Lab, to host and publish CGD. We wrote this report to explore this issue further, looking at existing models of data collaboration and outlining our first thoughts on the benefits and obstacles this kind of model might face. We welcome feedback from those with deeper expertise into different aspects of citizen-generated data, and look forward to refining these thoughts in the future together with the broader community. Members of the DataShift team will be attending the OGP Summit in Mexico City, and would be happy to discuss further – Mario and Zara will be speaking at this session on citizen reporting platforms at 2pm on Tuesday 27th as part of the Civil Society day and – together with Majo and Tin – will be attending the whole three days as well.